Source: CCSi - Credit Card Solutions, Inc.
P-Card Web Solution software for purchasing cards is designed for use by various types of organizations, from private to government, and offers ordering, reconciliation, and approval features using a standard Internet browser. The software is designed to provide a single system to manage and reconcile all p-card purchases whether made via the Internet, phone, fax, or in person. 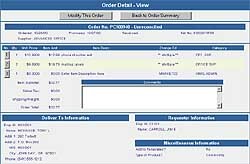 It automates the entire purchasing card process, from card application, order placement, and product receipt through transaction reconciliation, record retention, and auditing. In addition, the software works with any card provider; is compatible with popular enterprise resource planning systems (ERP) such as SAP, PeopleSoft and Oracle; and works side by side with e-commerce systems including Commerce One and Ariba. CCSi - Credit Card Solutions, Inc., 292 Torbett, Richland, WA 99352. Tel: 509-943-7998. Fax: 509-943-1976. CCSi - Credit Card Solutions, Inc.